Today, Mercy Housing announced a new partnership with Partnership for a Healthier America (PHA), an organization dedicated to solving the childhood obesity crisis. In partnering with PHA, Mercy Housing, the largest nonprofit provider of affordable housing in the country, committed to employ active design strategies at 80 percent of its affordable housing communities. Active design requires that residents have space to exercise, that housing providers promote healthy eating, that residents have a place to store their bikes securely, and much more. 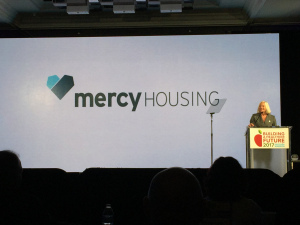 Jane Graf, CEO and President of Mercy Housing, announced the partnership at PHA’s “Building a Healthier Future” summit in Washington, D.C., and praised PHA for its commitment to helping children live healthier lives. The announcement comes at a time when one in five school-aged children has obesity. According to the Centers for Disease Control and Prevention (CDC), children with obesity have a higher risk of developing other chronic conditions including asthma, sleep apnea, bone and joint problems, and type 2 diabetes. Children who have obesity are also more likely to have obesity as adults; they also have a higher risk of developing heart disease, type 2 diabetes, metabolic syndrome, and several types of cancer. The Partnership for a Healthier America (PHA) is devoted to working with the private sector to ensure the health of our nation’s youth by solving the childhood obesity crisis. We bring together public, private and nonprofit leaders to broker meaningful commitments and develop strategies to end childhood obesity. Most importantly, we ensure that commitments made are commitments kept by working with unbiased, third parties to monitor and publicly report on the progress our partners are making to show everyone what can be achieved when we all work together. Founded in 2010 in conjunction with – but independent from – Let’s Move!, we’re a nonpartisan, nonprofit that is led by some of the nation’s most respected health and childhood obesity advocates. Supporting our effort is our honorary chair former First Lady Michelle Obama, alongside our honorary vice-chairmen The Honorable William H. Frist, MD, and US Senator Cory A. Booker (D-NJ). Our board of directors also includes nationally recognized business leaders, advocates, health professionals and thought leaders from a variety of backgrounds.